We often hear the expression of “talk the talk” to “walk the walk”. Jo and I are both passionate about our food, offering dishes freshly prepared and inspired by local, seasonal and wherever possible organic produce and ingredients. We really do believe it makes a difference, both taste wise and more importantly from a health perspective. Just ask our kids and they will repeat almost parrot fashion Jo’s urging, or they would say nagging, to “make healthy choices”! We’re now into our second season as Innkeepers and we’re trying to continue and expand that philosophy. Thankfully there is a new found awareness about the importance of what we eat. We’re blessed with several local stores offering a range of organic products and we find shopping every couple of days, may be a little more expensive but guarantees freshness and frankly supports those local business. Nauset Farm Shop is immediately opposite us and offers a gorgeous range of fresh products and a deli counter to die for. Phoenix Fruit in Orleans is like greengrocers used to be in the past. Fresh, local and organic, with a range of produce from Cape turnips to fresh galangal a thai specialality similar to ginger. 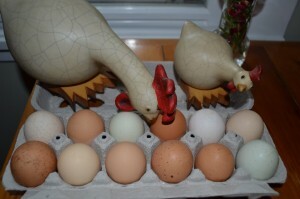 Lake Farm Gardens just up the road provide us with freshly laid organic farm eggs. They truly are special, the yokes a deep yellow and the taste how I remembered as a child! We are fortunate that Judy is able to give us the quantity we needed as she provides eggs to Phoenix Fruit and can also be seen at the Farmers Market in Orleans each weekend. We return the favor by providing our veggie and fruit cuttings back to Judy (the egg lady) to feed the chickens! We’re also thrilled that this spring, our son Charlie helped build two raised veggie beds in our back garden. 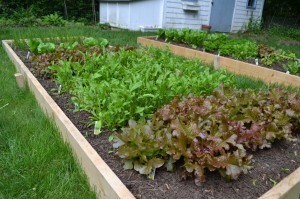 We have filled them with organic top soils and already are reaping the rewards to guests. All of our arugula, spinach and most of the fresh herbs are picked fresh each day. We have enough lettuce to feed an army, and we’re looking forward to planting summer veggies shortly. And, apart from the health benefits, it really is fun watching them grow and harvest them. Jo says she doesn’t, but I swear she talks to them each morning! No horrid “high fructose corn syrup”, or nasty “nitrates” in sight! Enjoy homemade granola (muesli) with of course organic 1% milk, seasonal fruits, organic savory frittata’s on a bed of baby spinach and arugula, and shortly home grown roasted cherry tomatoes and peppers. We’re taking the bold step of “talking the talk”, and “walking the walk”, and bringing the term “farm to table”, just one step closer. Have a happy and healthy summer season!